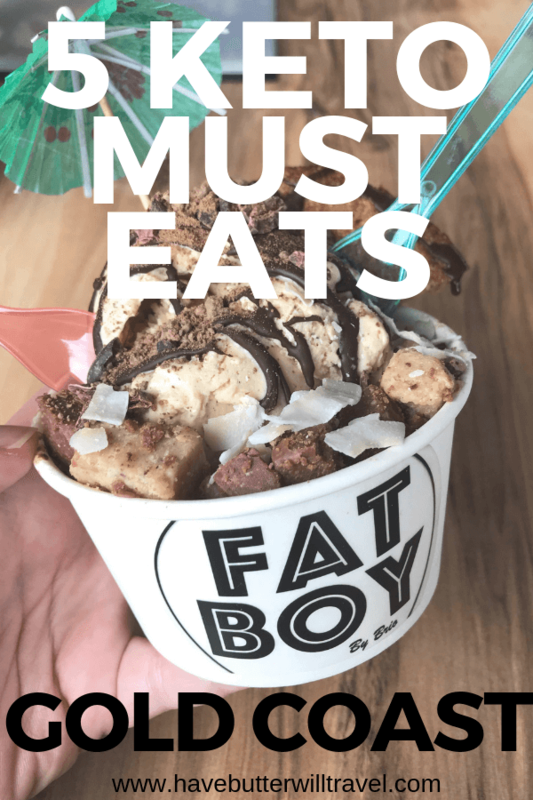 We were on the Gold Coast in October 2018 for the Low Carb Down Under Gold Coast 2018 conference and we wanted to check out the best keto eats on the Gold Coast while we were there. Let’s just say it didn’t disappoint. Two of our favourite keto places in Australia are on the Gold Coast so we made sure we had meals at both of them while we were there. Well we have to admit we ended up going here twice. We love this place so much. We headed to the new Burleigh Waters location after spending some time with Erika’s Nan on the day we arrived. This was mid afternoon and we both decided on a treat. Erika visiting her 92 year old Grandma. Erika chose a keto ice cream sundae. This is the description on the menu – Fatboy Sundaes single (1 scoop) or to share (3 scoops) fat burning sundaes… EPIC! 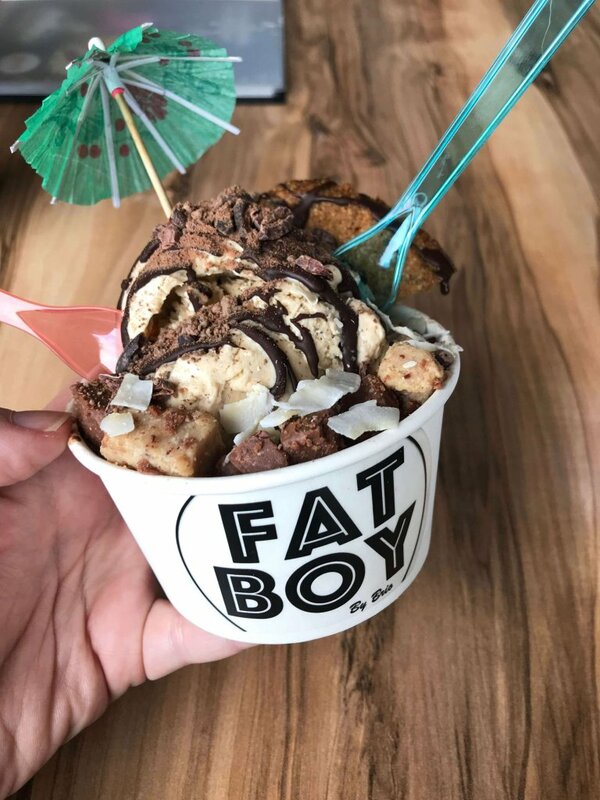 Your choice of ice cream flavour scoop/s covered w’ smashed cookies, chocolate bars, kibble and sauce – all keto friendly. YES! On our second trip we headed to the Broadbeach location on our way to the airport for breakfast. We decided to try three of their breakfast options. We didn’t opt for any of their drinks but they have some excellent bulletproof drink options on the menu. The first breakfast item we chose was a la vida low carb raw bowl. This was an acai bowl. It wasn’t labeled as keto, but it had some yummy low carb granola and fruit on top. This is the description on the menu. Organic pure acai, mixed berries, vanilla coyo topped w macadamia granola, strawberry, vanilla coyo, coconut, cacao nibs – banana free. The second breakfast item was avocado and tomato on toasted LCHF activated seed loaf. It is so good to be able to have avocado on toast and it be keto. We both really enjoy this simple pleasure. The third item was a breakfast bowl. We chose savoury mince, avocado and mushroom and it is served with scrambled eggs and a bed of spinach. Everything we had at Brio was really tasty and filling. This breakfast kept us going till we got home. This is the number one keto spot on the Gold coast. This is a must visit for any ketonian when on the Gold Coast. We were really lucky that Caffe Republic open really early on a weekend. They open at 6:30am and we were able to head there for breakfast before the conference started at 8am on the Sunday morning. We love that Caffe Republic have a K in the menu key for any of the dishes that are keto. This makes it really easy to order great meals and still stick to your ketogenic lifestyle. 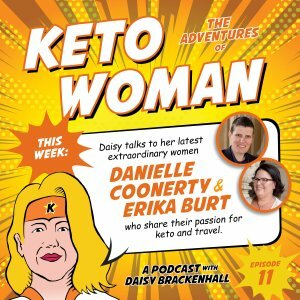 Obviously you still need to check if the ingredients are suitable for you as we did notice some of the meals marked as keto had sweet potato in them. So don’t be lulled into a false sense of security. As we were about to order we saw the specials menu and both decided on something from there. Erika chose the cauliflower waffles, which were made with cauliflower, egg and cheese. They were topped with poached eggs, avocado and bacon. I chose chicken karaage eggs benedict on some paleo toast. We shared these meals and they were both amazing. Hard to believe they were both keto. Eggs benedict is our favourite breakfast when eating out and this was one of the best we have had. Caffe Republic runs a close second to Brio in the race for the best keto eat on the Gold Coast. If you have time, make sure you support this place and have a meal there. We tried samples of some the breads and also bought some of the hazelnut and cacao cookies. We found the bread a little dense, but that is to be expected of seed bread. It would probably be nicer toasted. The cookies were a little crumbly and not sweet at all, but we enjoyed them. We didn’t have time to make it to BSKT on this visit. We have been there on a previous visit. They have some great options on the menu that are already low carb. They have a seed bread that you may need to check what is in it before ordering. I often find cafes difficult for lunch if they don’t have an all day breakfast menu, as they are often all sandwiches and burgers. BSKT has some great lunch options with poke bowls, miso salmon, a pad thai using zoodles, beef cheeks and nicoise salad. 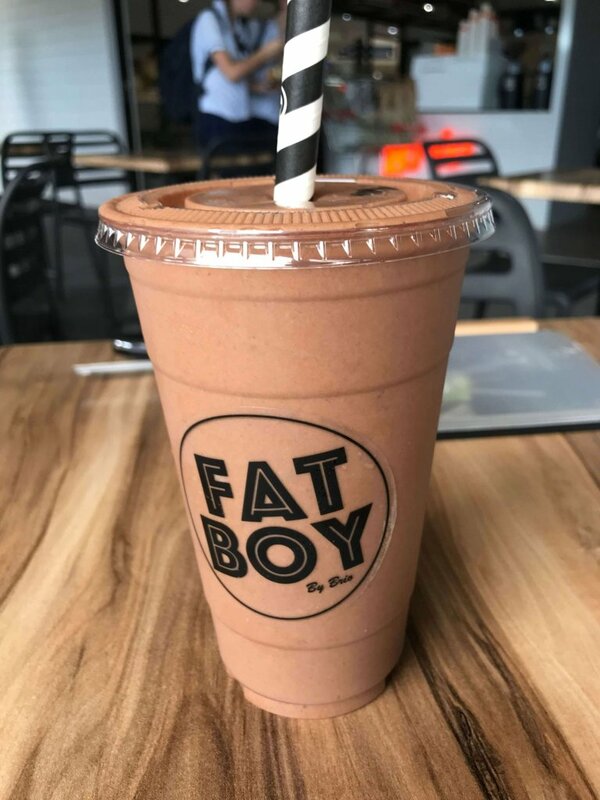 They also have a keto mocha shake on the menu. They are also doing dinners now on Friday and Saturday nights. Some of the menu items that sound great are cauliflower side, asparagus side, chicken wings, yellow fin tuna, slow roasted pork and steak. We headed here on the Sunday night after the conference had finished. We ordered the pork ribs with a dry rub, to try and avoid a sweet sauce and just ordered extras. These included beef brisket, smoked sausage and chicken wings. The thing we loved about this place was that you could order the meat on it’s own. 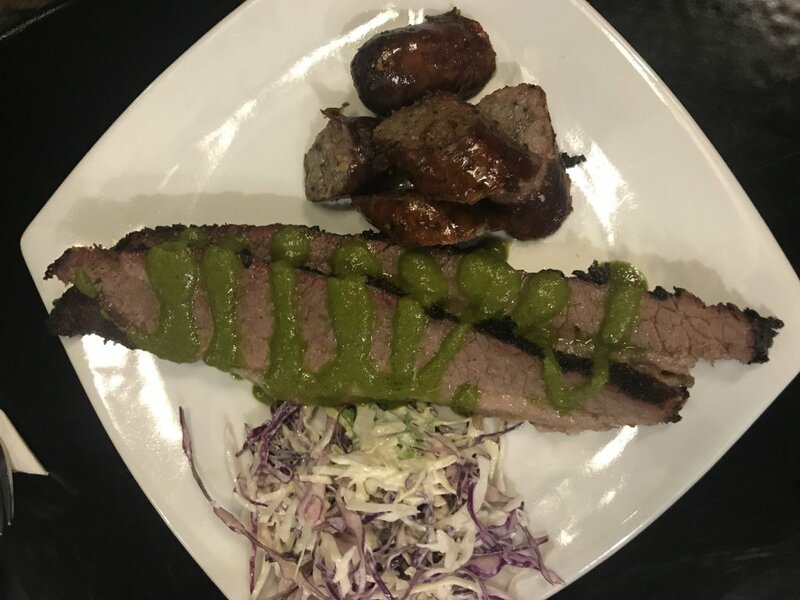 We really enjoyed the brisket with chimichurri sauce. The ribs with the dry rub were our least favourite. The meat was really good, but the dry rub wasn’t cooked and tasted a little strange. If you are looking to order here I would recommend just ordering a bunch of the extras. Most of these are keto friendly including beef ribs, beef brisket, pulled beef, pulled pork, smoked sausage and chicken wings. We love burrito bowls here at Have Butter will Travel! We ordered a pork and a chicken and asked them to hold the beans and rice. They asked if we would like extra spinach and lettuce instead, which was perfect. The meat had really nice flavour and we added some mushrooms, which were really nice. They also have a green goddess salad that is labeled low carb. I wouldn’t recommend going out of your way to try this place, but if you are staying near Palm Beach it’s a great quick and easy option. They also have 3 locations in Sydney. Bondi, Cronulla and Parramatta. This place looks fun and quirky. We didn’t have time to get there on this trip. They offer a naked option on all their burgers. They have some fun and creative names for the burgers like limp brisket, Kevin Bacon and big poppa. This is the type of place where we would enjoy the naked burgers and not stress about possible sugars in sauces etc. There are several other locations around Australia including Melbourne, Sydney, Brisbane, Toowoomba and Canberra. This is really exciting for low carbers. This restuarant is now offering zoodles with all their pasta dishes. 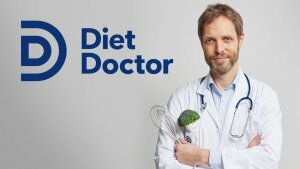 This is a game changer for those living a low carb lifestyle. Italian pizza & pasta restaurants like this have been a no go for us since starting our keto lifestyle, but now we can go here and order any of the pasta sauces and ask for zoodles. We definitely didn’t have time on this trip, but we are keen to find time to go here in Melbourne soon. 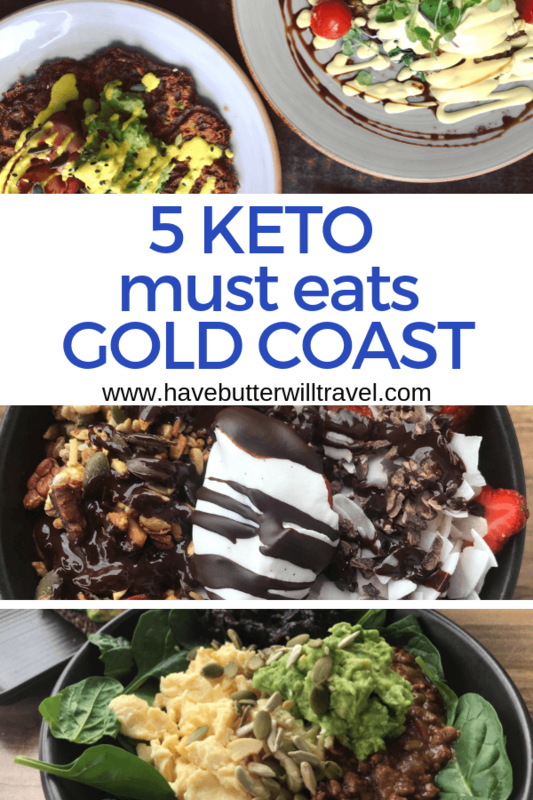 The Gold Coast has lots of restaurants and I am sure you could go to many of them and find a keto option. 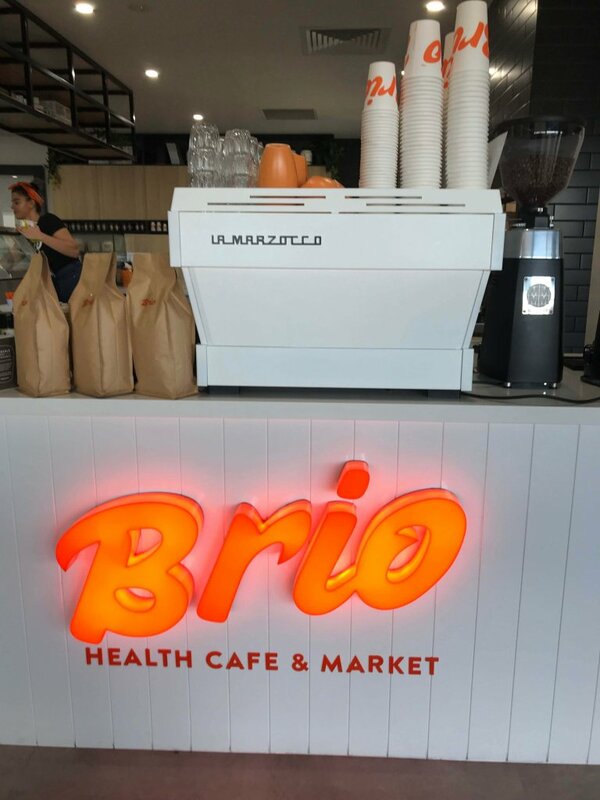 What sets the Gold Coast apart from other cities in Australia is Brio Emporium and Caffe republic. 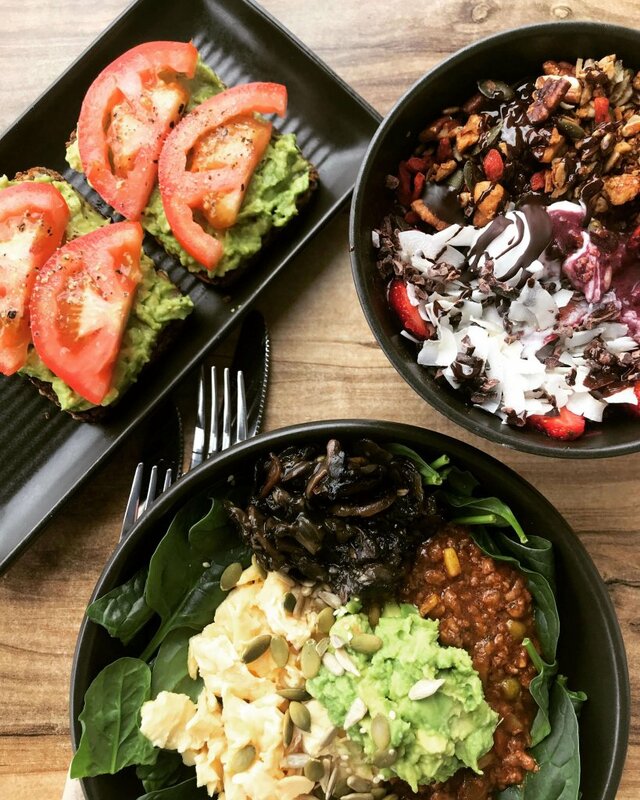 To have 2 cafes doing great keto options is excellent and better than what we have found offered in some of the bigger cities like Sydney and Melbourne. 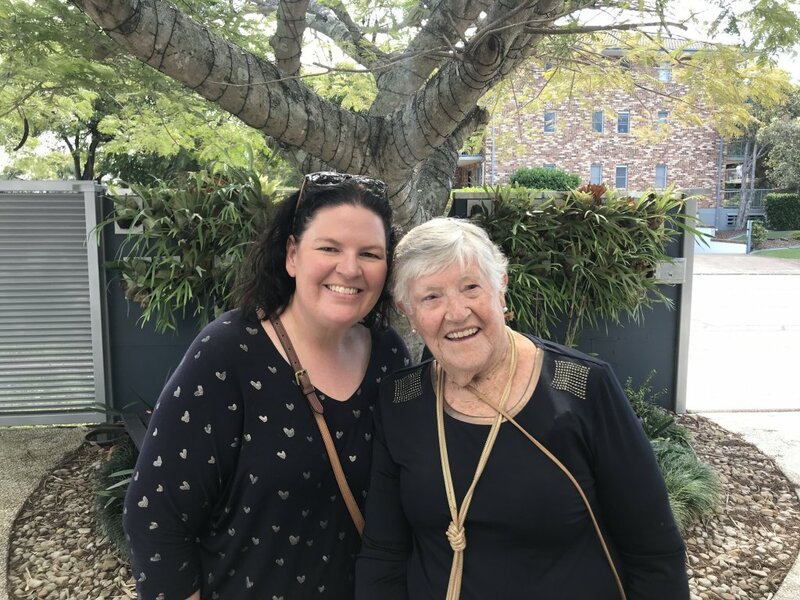 We are lucky enough to have Erika’s Nan on the Gold Coast, so when we visit her, we get to head to two of our favourite keto places in Australia. So it’s win win. 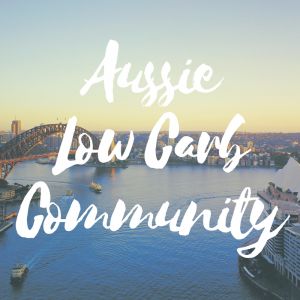 We would love to hear about your favourite keto eats on the Gold Coast. What did we miss? What places do we need to add to our list for our next visit? Let us know in the comments below. 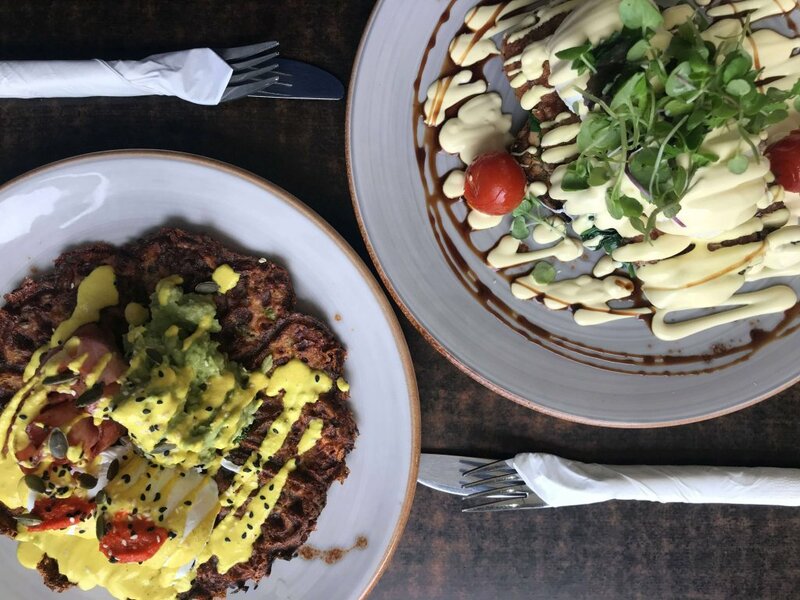 If you love this keto must eats on the Gold Coast, check our other keto eats locations. Mouthwatering selections…great info and filed away for our next visit to the Gold Coast, or maybe we will just go there because of what is on offer…thanks for the details. P.S: Is the Karagee Chicken keto, or low carb? It was marked as Keto, we didnt ask questions though and we were both a bit unsure. We went with it, but it was only a special so may not be on there next time. We were really happy with the places we found whilst there.